Published on March 28, 2015 in Elections, General T&T, Media, Opposition Party, Parliament, People's Partnership, PNM, Politics and UNC. 21 Comments Tags: Abuse, Kamla Persad-Bissessar, Keith Rowley, Politics, T&T Govt, Vernella Alleyne-Toppin. Prime Minister Kamla Persad-Bissessar said last night that she too condemns the controversial statements made by Tobago East MP Vernella Alleyne-Toppin but she has also accepted her apology. 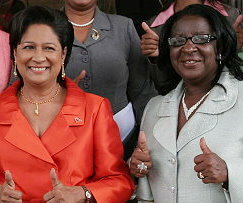 Persad-Bissessar said she expressed this to Alleyne-Toppin “directly”.